A poker table is a table specifically designed for playing card games, usually poker. It is often covered with baize which is a type of felt, or speed cloth, a teflon-coated fabric that helps the cards slide easily across the surface. It is either an actual table or a fold-out tabletop surface. Those used in professional televised poker feature "pocketcams" which can view a player's pocket, or hole cards. 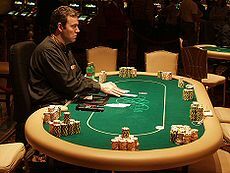 Such tables are usually fairly oval-shaped, with the players sitting around a curve of the table with a dealer facing them in an indented area of the table made specifically for the dealer. In amateur poker, tables are often oval, round or octagonal, using a rotating dealer position. The edge of the table is usually padded and raised slightly for the players to rest their arms, and this section is called the "rail". There is often a section of wood between the rail and the playing surface; this is called the "race track" and often features cup holders as well. The center of the table often features an image, usually the name or logo of the casino or house where the game is being played.